Soyuz FDR (Flight Data Recorder) is designed to work in Soyuz Alliance system to transmit to the website detailed information about the flight. The basic source of flight data is VATSIM and IVAO statistics. 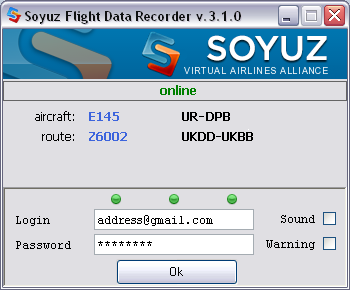 Soyuz FDR client registered detailed flight information and send it to a server. Only online flights in VATSIM or IVAO networks are allowed. Flight booking, information about current flights, statistics and other information are available on this site. It is recommended to install the program to separated folder, because it creates a lot of files. Under	Windows 7 (8) do not install the program to Program Files or Windows folders, because by default they are "read only" and Soyuz FDR will not be able to create working files. Registered FSUIPC (XPUIPC for X-Plane) and .Net 3.5 (or higher) are required. Pilot's callsign in VATSIM or IVAO is the same as booked. Pilot's callsign is corresponded to flight number (or flight number included to Flight Plan Remarks in special format RTE/PS101). Booking should be active. Booking is still active in 30 minutes after planned departure time. If by this moment flight is not registered by the system, booking will be deleted. Flight Plan should be registered in the network (VATSIM or IVAO). It could take up to 5 minutes to get Flight Plan from the network to the system. The airplane should be on a ground in departure airport. 1. Waiting mode. Connection to FSUIPC is established, waiting	for Flight Plan from the network (VATSIM or IVAO). 2. Online. The flight is registered in VA system, Flight Plan is corresponding to booked parameters. 3. Online. The flight is refused by VA system, because Flight Plan is not corresponding to booked parameters. 4. There is no connection to FSUIPC. Perhaps, FS is not running. 5. There is no connection to site. Perhaps, wrong login or password. Main window could be opened by double-click on system tray icon or via context menu Options (right-click on system tray icon). You have to set your Login (e-mail) and Password (the same as for Soyuz Alliance account). Optionally, you could set checkbox Sound to turn on sound signals and Warnings to receive flight alerts. All settings are saved to ini-file. In online mode main window shows aircraft type and tail number, flight number, departure and destination airports. After landing, vertical speed of touchdown is shown. Debug mode could be used to get more information about programm errors in case of need. Debug messages	are shown in main window.